Whitaker needed an online system for managing their clients and client orders. Using PHP, jQuery, and HTML/CSS I created an admin system for managing their clients as well as setting up and managing their Google places account and a rebranding of their website. The new system allows an admin to monitor new order requests and quickly manage all new requests that have not yet been addressed. Clients can also log in and manage all of their order requests. 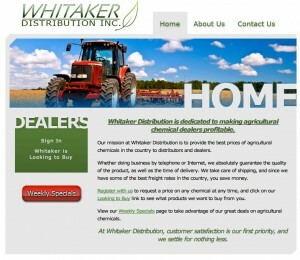 There is also a basic CMS that allows Whitaker to easily update their prices and sales. Caleb is a one-stop web shop. He earned a Masters in Computer Science while moonlighting as an artist. Whether you need a stunning design or hard-core development, you are in the right place.